LAKE PEMBROKE - DESOTO COUNTY - YOU WILL LOVE THIS WELL-MAINTAINED 3/2/2 GREAT ROOM FLOOR PLAN HOME ON LAKE IN A QUIET NEIGHBORHOOD. GORGEOUS WATER VIEW FROM MOST ROOMS. THE HOME HAS LUSH LANDSCAPING, TILED FRONT ENTRANCE AND BEAUTIFUL ETCHED GLASS DOOR AND SIDE LITES. THE KITCHEN AND BREAKFAST NOOK AREAS TAKE ADVANTAGE OF THE VIEW OFFERED BY ALL THE WINDOWS ON THE LANAI AND THERE ARE SLIDERS IN GREAT ROOM AND BREAKFAST NOOK AREAS THAT OPEN TO THE POOL AREA. THE PRIVATE MASTER SUITE IS HUGE WITH ACCESS TO LANAI, WALK-IN CLOSET AND REGULAR CLOSET, JETTED TUB AND SHOWER WITH DOOR, 2 SINK VANITY AND PRIVATE COMMODE. THE GUEST WING HAS FRONT BEDROOM, LARGE GUEST BATH AND BACK BEDROOM WITH ACCESS TO LANAI, ALSO. YOU HAVE A COVERED LANAI AREA FOR SHADE AND A LARGE AREA FOR SUNNING. THE SPA WATERFALLS INTO THE HEATED POOL AND THE POOL AREA IS STAMPED CONCRETE DESIGN. YOU CAN SPEND HOURS OUTSIDE WATCHING THE WILDLIFE AND ENJOYING THE 180 DEGREE LAKE VIEW. THE ATTRACTIVE SIDE ENTRY GARAGE MAKES ENTRY TO THE HOME THROUGH THE LAUNDRY ROOM WHICH HAS A TUB FOR EASY CLEAN UP JOBS. CENTRAL VAC, HIGH WIND GARAGE DOOR, INTERCOM, UNDERGROUND UTILITIES AND NEWER HOT WATER HEATER ARE A FEW BONUS ITEMS. THE LOT MEASUREMENTS INCLUDE A PORTION OF THE LAKE. SEE SURVEY. HOME IS SOLD AS IS. LOCATED CONVENIENTLY NEAR I-75 ACCESS, SHOPPING, RESTAURANTS AND MORE! 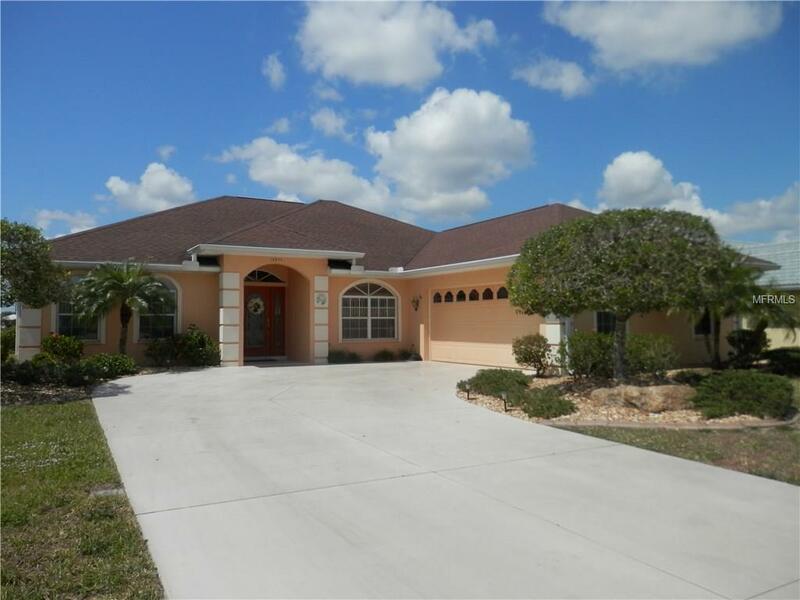 Listing provided courtesy of Keller Williams Peace River Pa.
© 2019 My Florida Regional Multiple Listing Service, Inc. All rights reserved. All listings displayed pursuant to IDX. All listing information is deemed reliable but not guaranteed and should be independently verified through personal inspection by appropriate professionals. Listings displayed on this website may be subject to prior sale or removal from sale; availability of any listing should always be independently verified. Listing information is provided for consumers personal, non-commercial use, solely to identify potential properties for potential purchase; all other use is strictly prohibited and may violate relevant federal and state law. Data last updated 2019-04-22T23:16:50.677.